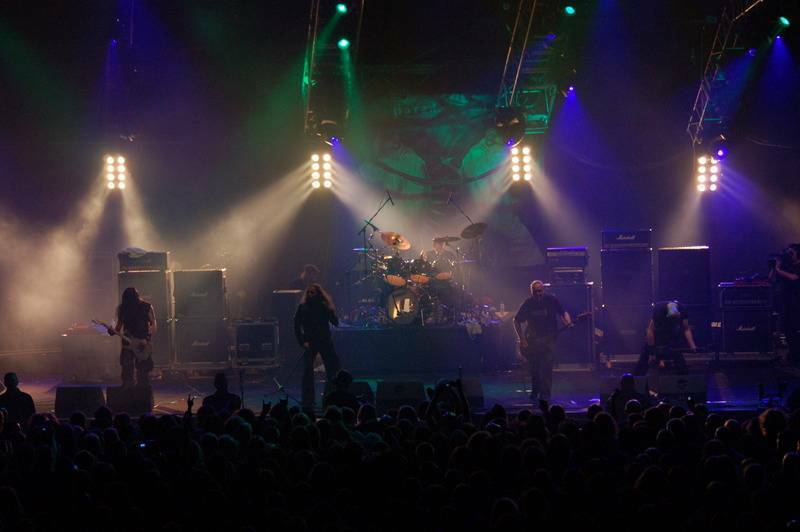 Thirteen albums into Paradise Lost's 20+ year career, namedropping is pointless. The only band they can and should be held up against for comparison and consideration is Paradise Lost.With a career dating back to 1988, and their official recording debut in 1990 (Lost Paradise), the band has been riding and rollercoaster of highs and lows that began in earnest with their fourth album, Icon, in 1993. 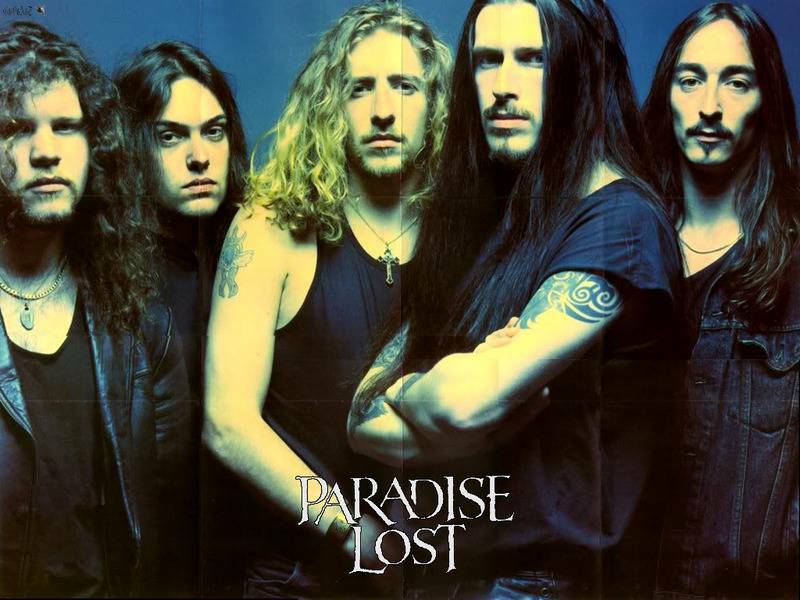 It presented Paradise Lost as a band that had more to offer beyond their established doom-death metal sound, driving the point home in 1995 with Draconian Times, an album that is considered to be a goth metal benchmark to this very day. That they would follow their international breakthrough with a slide into the realms of electronica only two years later (One Second) boggled the collective mind of Paradise Lost’s devout fanbase, yet their new direction earned a following of its own. The band made a gradual return to the swamp that spawned them, however, beginning with 2002’s Symbol Of Life. Elements of their favoured doom-goth sound grew consistently darker and louder with each album that followed, and each time the curiosity as to how far Paradise Lost would take this comeback grew.It’s fair to say the band’s new outing, Tragic Idol, is the album fans of the Icon and Draconian Times era have been waiting on the edge of their seats for.Recorded at The Chapel Studios in Lincolnshire, England, with vocals laid down at Fascination Street Studios in Orebro, Sweden and produced, mixed and mastered by Jens Bogren (OPETH, BORKNAGAR), Tragic Idol is a no-holds-barred album that, according to guitarist Greg Mackintosh, was “influenced more by classic metal and classic doom metal than anything else.” Lead-off track ‘Solitary One’ the closing dirge of ‘The Glorious End’ echo this statement with their crushing doom approach, while the sledgehammer riffs of ‘Crucify’, ‘To The Darkness’ and ‘In This We Dwell’ draw Paradise Lost out of the goth realm, simultaneously pulling naysayers of the genre into the darkness. This is par for the entire course of Tragic Idol; for every plodding doom-oriented track there is a song loaded with traditional metal riffs and guitar leads, making it a feast for anyone who takes pleasure in being crushed by a wall of guitars.Vocalist Nick Holmes leads the charge, as always, singing his guts out rather than opting to growl and croon his way through the proceedings. In a day and age when gothic metal is often defined by how closely the vocalist can mimic the late and great Peter Steele (TYPE O NEGATIVE), Holmes attacks with a diversity and aggression that raises the bar for veteran would-be goth heroes and newcomers to the scene.Holmes’ lyrics have always been traditionally dark and introspective, and Tragic Idol is no exception. There are no verses for the fantasy and folk metal set, no tales of boy-meets-girl; he chooses instead to focus on the depths of stark reality.“I wrote a lot about truth and honesty,” says Holmes. “We've got a song called ‘Honesty In Death’, and (my) initial thoughts were about how humble death makes people, how insignificant little problems are. It makes you realize what’s really important in life.”As for calling the album Tragic Idol, it’s the appropriate title for an album unleashed upon a modern day society that, in general, believes all that glitters is gold. 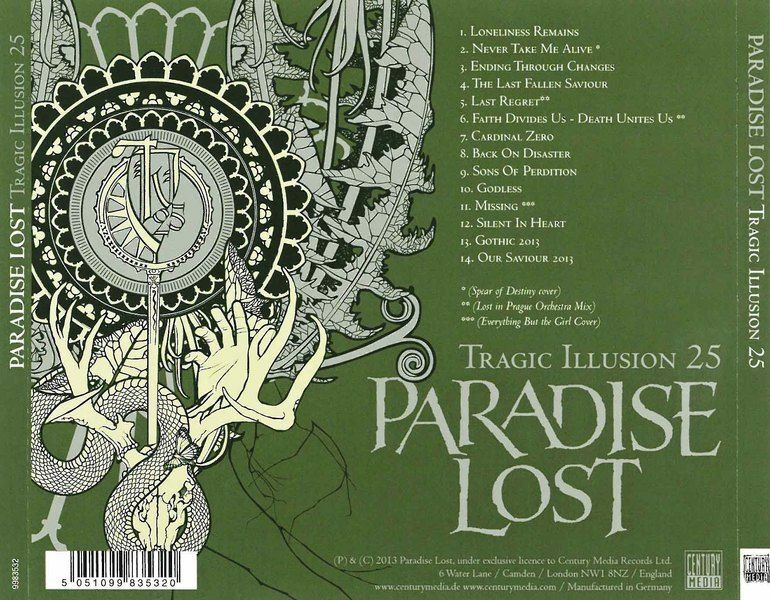 The title track is a classic case of Paradise Lost putting life in perspective and pounding the message home:“It’s about the beauty and innocence of youth,” Holmes says of ‘Tragic Idol’. “Worshipping another human being with an equal amount of susceptibility to pain, suffering and depression as the next person, but by some chance has been propelled into some godlike status. Adulation eats away and makes the person ugly on the inside, believing their self importance to be above others, not realizing their insignificance and irrelevance in the grand scheme of things.”Tragic Idol as a whole isn’t merely Paradise Lost’s long-awaited return to form; it’s a soundtrack inspired by life, served up as a well-meant kick in the teeth. 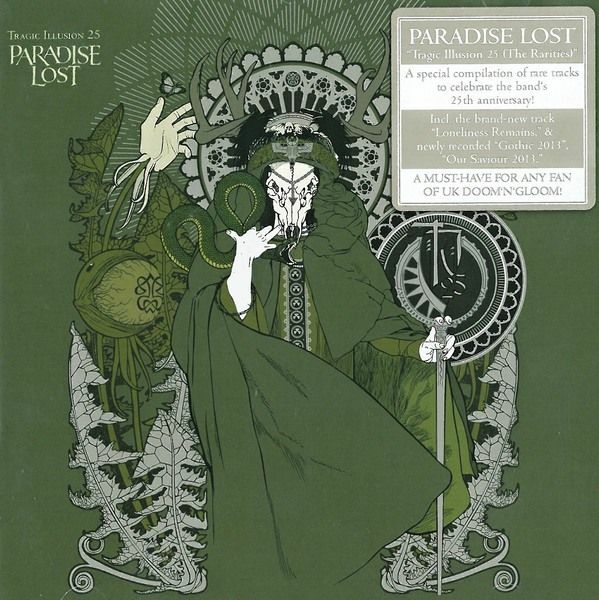 PARADISE LOST is not a band that does too many compilations (Live albums aside), unlike a lot of bands that release a greatest hits album after ever two studio albums, PARADISE LOST in their illustrious quarter of a century long career have released only one compilation album titled "Reflections" and that was a long time ago, and so it's time for the bands second compilation, and once again, the band surprises, instead of releasing the standard "best of", they have decided to treat the fans with a B-sides and rarities compilation.So, what's in store for us? A lot of things we haven't heard, or at least things that people who haven't been able to get the special editions of their latest albums haven't heard. That's right; the album consists of mainly bonus tracks that were featured on digipack / vinyl / special editions of the bands albums, in addition to some covers. The real gem are re-recordings of two of the bands classic songs "Our Savior" from the band’s debut "Lost Paradise" and "Gothic" of the sophomore album of the same name. The record is more intended for fans than the general public, some things are just fascinating to hear.Take "Missing" for example, it's a cover of dance duos EVERYTHING BUT THE GIRL hit single, a song that I personally never considered as a candidate for a Doom / Gothic Metal reworking, but having first heard it on the special edition of the band’s 2007 masterpiece "In Requiem" I was surprised at how well it worked, a rather dramatic rendition with the classic PARADISE LOST edge to it.I also greatly recommend you go out of your way to check out the 2013 re-recordings of "Our Savior" and "Gothic", the band did a fantastic job updating these classic with a modern production and allowing the listener the rare chance to hear what these songs would sound had their classic albums been recorded today, the re-recordings feature very heavy growling vocals from frontman Nick Holmes (especially on "Our Savior") with updated production values and improved musicianship on the part of the entire band. The tracks however lose none of their edge with the newer production as they keep their classic feel.If I was to find any fault with the compilation is that I would have liked to see "Walk Away" a SISTERS OF MERCY cover, or "How Soon is Now" a SMITHS cover both released during the "Draconian Times" period, but those are minor gripes as this album gives a glimpse at some rare and fascinating material. Návrat na "GOTHIC, DOOM, DARK Metal"